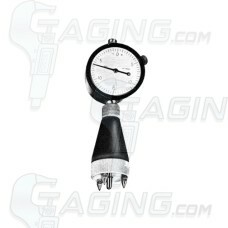 Gaging.com LLC carries the worlds finest measuring tools in the field of Aerospace. We have personally dealt with 100's of applications ranging from bore measurement, surface finish, precision leveling and many more. Call us and take advantage of our experience, knowledge and low prices! ACCURATELY AND EFFICIENTLY MEASURES THE FLUSHNESS OF WELDS, RIVETS & SCREW HEADS The Barcor Rivet..